Of the worlds' major wine producing countries, Portugal is the most mysterious. We all know something about Port, less about Madeira, and we mostly acknowledge that they make pretty good table whites out of grapes nobody else uses. But they do some stuff that seems downright weird in the increasingly homogenous wine world, like growing grapevines on trees and selling white wine that may or may not be fizzy. * Portuguese whites are mostly thirst-quenching, simple and good value. I found only one that I adored (more on that later), but very few I disliked. Most would be great quaffers on a hot day. * Alvarinho (better known as Albarino in Spain) seems clearly the best white wine grape. I also liked wines made from Arinto, which makes crisp, fresh-tasting whites. * All the best red wines are field blends; that's how they do it there. Mostly they are made of the same grapes that make up Port -- Touriga Nacional, Tinta Roriz and Touriga Franca. * New World winemaking has hit Portugal, but not yet with complete success. I'm sure there are a few fine blockbuster reds available, but I didn't taste them. * Red wines that have labels clearly designed for export tended to be very simple. The reds I liked best tended to have non-flashy labels, essentially focusing on the name of the wine. * Madeira is a fabulous value in a dessert wine. As with Port, it's not necessary to overspend on vintage Madeira because the 10-year-aged Madeiras are often just as delicious. While I tended to prefer the non-New World wines, my favorite white wine from this tasting was very modern: Quinta Lagoalva de Cima Ribatejano Arinto & Chardonnay 2008 ($14). Winemaker Diogo de Braganca Campilho was at the event, and he told me of a very unusual technique for this wine: He keeps Chardonnay lees frozen for two years to add to the barrels during malolactic fermentation. In other words, this wine is made from 2008 grapes with 2006 Chardonnay lees. The grapes are all from the Ribatejo district near Lisbon, a wealthy area because the soil is so fertile (not the case all over the country). That said, the district has not generally been considered one of the best for wine for the same reason: yields are high, and lots of sun leads to relatively high alcohol levels. 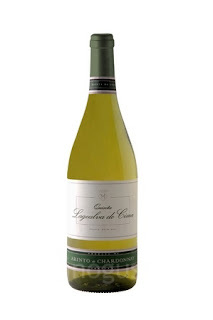 Campilho felt the need to innovate -- Chardonnay is still unusual in Portugal -- and to me, his experiment really paid off. His Arino-Chardonnay mix is a full-flavored wine, well-balanced and interesting, with lots of fruit, and you don't notice the 100% malolactic fermentation except in the smooth mouthfeel. I tasted white peach and also red apple and floral notes. At $14, this wine is a steal. Downside: It's not currently available in California. If you want something more traditional, check out the delicious Aveleda Alvarinho Vinho Verde 2007, which tastes green and fresh, like its Spanish cousin. Vinho Verdes that say "Alvarinho" tend to taste more like the grape than the style. This post is getting long so I'll get to reds and Madeiras tomorrow. Below are my unedited tasting notes for the whites. No picking on me for typos! All from the same company, I tasted an unpleasant cementy note on each. Pass. Antao Vaz, Verdelho, Viognier. I can taste an oak board in this. Pass.